On a tour of London's wartime landmarks, Mark Dapin finds the commentary twice as interesting as expected. At first, it looks as though I'm the only traveller to turn up for the London's Burning walking tour, and the official City of London guide, Keith Warner, is clearly worried when I say I have to go and buy a sandwich. "You're coming back, aren't you?" he asks. When I return five minutes later, Keith has been joined by a young woman named Stacey, who has come all the way from Canada, and a middle-aged man named Richard, who has come all the way from Croydon - which isn't far at all. It now appears there are three tourists to one guide. At this point, we don't realise that Richard has other ideas. In living memory, central London hasn't looked as beautiful and complete, as clean and as safe, as it does today. At the same time, there is an extraordinary interest in Hitler's Blitz, when it was one of the most dangerous places on Earth. Winston Churchill's Britain at War Experience museum, near London Bridge station, offers a troubling, immersive taste of life on the home front when the bombs began to fall. And at least three separate tours leave from St Paul's Cathedral every week, to examine the remnants of London's worst disaster. While the Great Fire of 1666 destroyed 80 per cent of the city, it's generally held that only about eight people died. During the Blitz on London, between September 1940 and May 1941, more than 25,000 civilians lost their lives. Keith begins the London's Burning tour with a brief history lesson to explain "why London suddenly found itself at war with Germany". He is a good, funny, knowledgeable guide, who grew up in Limehouse in the East End. He explains Hitler was on the verge of wiping out the RAF in the Battle of Britain - which may or may not be true - when he turned his attention to London "basically because he was a madman and wouldn't listen to his generals". Hitler hoped to bomb the civilian population into submission, and the Luftwaffe set London aflame, terrorising the city with nightly raids. The river that had been the source of so much of London's wealth became its downfall as, on moonlit nights, the bombers traced the course of the Thames to their targets. Churchill believed St Paul's Cathedral was a symbol of British freedom, and declared that under no circumstances was it to be destroyed. The cathedral had its own fire watch, with 24 volunteers guarding it day and night, and it survived the Nazi onslaught while all around it burnt. Keith produces a famous photograph of the dome of St Paul's rising intact above the smoke of a city apparently in ashes, like God's own embassy in hell. "Have you seen this picture?" Keith asks. "Yes, I've seen that. Am I right in saying the photographer who took that was standing there," Richard says, pointing to the spot, "and all he could see was smoke?" "He didn't know if the cathedral had gone or not." "As it cleared," Richard says, "he could see ..."
Richard is quiet, but not for long. In the shadow of St Paul's sits a memorial to civilians who died in the Blitz. "Churchill always said that the worst thing Hitler did was to bomb London," Keith says, "because he angered the British people. And you don't want to get the British people angry, because then they become totally defiant and never give in." "That's the worst thing he did?" she says. "Like, the Holocaust was pretty bad." Keith is stumped. He was only quoting Churchill, after all. "We're not making a comparison with that," he says. "You can't do." We walk for a short while to a lovely garden, which, Keith says, once belonged to "Greyfriars Christ Church". "Greyfriars Monastery?" Richard asks, correcting his tour guide. "I was going to go there," Keith says, wrestling back the initiative, "but I'll start immediately. This was a Benedictine friary, founded in the 12th century and, as Richard rightly says, it was called Greyfriars Monastery, because the monks would've worn habits that were grey, to distinguish them." "I can tell you that," Richard says, quickly. He turns to Keith. "I'll give you a break, if you like." "We had three monasteries," Richard begins, "quite rightly, as Kevin [sic, Keith] says, we had the Greyfriars, and we had the Whitefriars and the Blackfriars ..."
He then recounts the story of Henry VIII's dissolution of England's monasteries. Christ Church Greyfriars was a Wren church. It was devastated by the bombing and only the tower was rebuilt. The remnant walls and garden were left as a monument to the Blitz. Nearby, Keith shows us another ruin, an overgrown trench surrounded by crumbled wall, like a canal bed that has been filled. "What have we got here?" Keith asks, gazing into the pit at layers of historic masonry. "We've got a Roman fort," Richard says. "What've we got that's more modern, though?" Keith says. "Well you've got mediaeval ... and you've got Victorian brickwork," Richard says. "And you've got a Norman hospital." "We've got all that," Keith says. "You're absolutely right, Richard. But what we've got here IS A BOMBSITE!" Richard laughs, because he has a sense of humour as well as a startling depth of archaeological knowledge. "In 1945, much of London looked like this," Keith says. "And this gives you an idea of the effects of the Blitz here in London." We have all learnt a lesson. St Alban's on Wood Street is another gorgeous old Wren tower, the last relic of a church obliterated during an air raid in 1940. This 28-metre tower, too, is now somebody's home, a fact that excites much comment among our small tour party. "You imagine, if you had bags of shopping," Keith says. "You'd have to hump it right up to the top, and then if you'd forgotten something - you'd run out of tea, or something - you'd have to come down again." There is broad agreement that this would not be a good place to live. "And, like, everyone would knock at your door thinking that they could come in," Stacey says. "There's nowhere to park your car here," Richard says. "You've got that wonderful building ... and you can't park your car." It's a gloriously English comment. As if we're in competition to display our national characteristics, Stacey suddenly makes the definitive North American comment. "I love your guys' police," she remarks, apropos of nothing. "They're dressed so cool. With, like, the hats." "You like the bobbies' helmets, do you?" Keith says. "Ah!" Richard says. "Do you know why they're called bobbies? Right, well, it goes back to one of our kings of England, King William IV ..."
St Mary Aldermanbury was yet another Wren church, smashed to rubble by German bombing. All that remains is a plaque. The stones were shipped to the US after the war, where the church was rebuilt in Filton, Missouri, in honour of Churchill, who first used the term "Iron Curtain" to describe the Soviet bloc, in Filton in 1946. "Did you know about that, Richard?" Keith asks of the speech. "I didn't know about the Iron Curtain speech," he admits. "Oh, you didn't?" Keith replies. "That was a new one?" "I can never remember the name of that place," Keith says. "It was ..."
"... Blue Water," Richard says. "Lake Havasu," Keith says, "which is North American Indian for 'blue water'," Richard says. 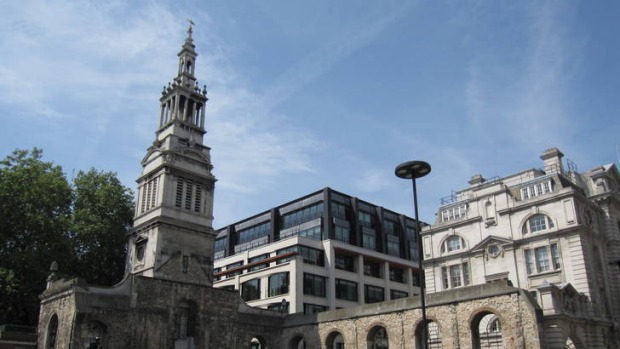 Keith takes us to a beautiful, hidden square bounded by the Guildhall - home to the offices of the City of London Corporation, and heavily bombed during the war - and the Church of Lawrence Jewry, also badly damaged during the Blitz. It's a gorgeous, peaceful place, and I can't understand why I haven't found it before. One of the great tragedies of the Blitz occurred at Bank Junction, the heart of the City of London, where three great institutions meet: the Bank of England, the Royal Exchange and the Mansion House. In 1940-41, civilians used to shelter from the German bombs in the Bank underground station. When the Blitz began, the government discouraged the use of tube stations as shelters, in part because it feared the people would feel so safe underground they would be reluctant to come back up again. But, after a while, the authorities relented and up to 150,000 people would spend their nights in the tunnels. Most nights, they were safe, but in January 1941, a huge German bomb plunged into the ticket office, where it exploded, creating a fireball that killed 56 people, injured another 69, and left behind a crater 30 metres deep. I can't leave the tour without tackling the enigma of Richard, so finally I ask what he does for a living. He tells me he is a cabbie but that taxi driving is "not rocket science". He picks up a fare at Waterloo and takes them to Kings Cross, then takes another from Kings Cross to Waterloo. He has decided to enliven his passengers' journeys with historical commentary, mainly learnt from books. Keith says he gets all sorts of holidaymakers on his various walking tours. He mostly guides visitors from English-speaking countries such as Australia and the US, as well as a few Germans and Dutch "because their English is always very good". And how do the Germans feel about the Blitz? "You have to be very discreet," he says. "If I find we've got a German, we obviously just talk about 'enemy action'. It's probably not a walk they would come on." Getting there Singapore Airlines has a fare to London from Sydney and Melbourne for about $2050 low-season return, including tax. Fly to Singapore (about 8hr) and then to London (14hr 10min). See singaporeair.com. Touring there For Keith Warner's walks and talks, phone +44 7710 284 017 or +44 207 537 7746, email k.warner502@btinternet.com. City Guides' London's Burning walk starts from the City Information Centre, St Paul's Church Yard, 2pm Thursdays and 11am Sundays. £7/£6 ($11/$9). Winston Churchill's Britain at War Experience, 64-66 Tooley Street, London Bridge. Open seven days. Adults £12.50/under-15s £4.50/under-5s free. Phone +44 (0)207 403 3171.